At this time last year I decided to start a perennial gardening business. I wanted to make better use of my backyard plus I am plant addicted and feel you really can’t have enough plants. During the summer I collected plants and in the fall I set up a starter garden for the perennials. Theses were for the plants I bought, found or traded for. I divided the perennials that you divide in the fall and covered the soil with a heavy mulch to stop weeds from growing and to protect the plants from heavy frosts. This spring I worked the mulch into the ground and found more plants to add to the collection. I also divided many of the plants that should be divided in the spring. My plants quadrupled in a twp week times from dividing plants. The divided plats will be ready to sell in the fall. Last year at this time I had about 150 perennial plants. This year I have 2000 plants that are a good size and healthy. By fall, even with sales I will have about 5000 plants. My goal was to start a perennial gardening business on a budget by finding or trading plants and purchasing plants that could be easily divided for more new plants. I wanted to set up a backyard business that is enjoyable. I spent $50 last year and have made $500 this spring just selling a few plant varieties I don’t like to grow. In the fall I hope to have a business that can be run full time. From houses that are going to be torn down. Ask first! Along the road and abandoned houses. This last week stopped at two garage sales and they had beautiful gardens. I asked what they did with their plants when they divided plants and worked in the garden and they admitted they just tossed them. So I made arrangements to pick up their “homeless” plants. I have 4 boxes of plants (about 200 plants and 12 new varieties) and in a few weeks I will be getting more perennials. 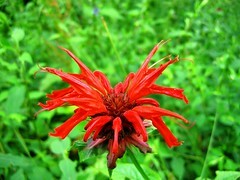 I also plan to sell my bee balm patch that has taken over an old garden. It’s a lovely plant and I plan to keep some of the plants but I have dug up 100 clumps of bee balm and it’s going to a flea market tomorrow. The money I make from the plants will go to buy new plant varieties I don’t have. Another suggestion that will save you money is to make your own compost for your plants which will cut back on buying soil. Free pots and garden containers can be found along curbs that are being tossed out or at garage sales. So when it comes to saving money on plants, ask around. 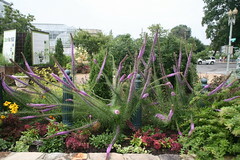 You will be surprised what plants you can get for free or for trading. It adds to the fun of gardening and makes for a prettier backyard garden area.